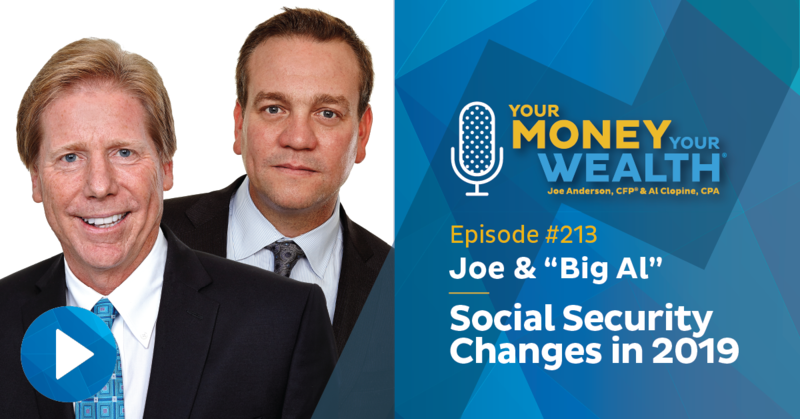 Joe and Big Al discuss 7 changes to your Social Security for 2019. No wait, six changes. Well actually, it’s more like 5 changes and a useful tidbit. Plus, when to claim your spousal benefit, whether to buy long-term care insurance or self-insure, how to get more growth in your portfolio without adding more risk, and where to keep your emergency funds. (11:25) Should I Claim My Spousal Social Security Benefit? (23:15) How Can I Get More Portfolio Growth Without Magnifying Risk? (31:22) Where is the Best Place to Keep Emergency Funds? Today on Your Money, Your Wealth®, Joe and Big Al discuss all sorts of things that affect your ability to have a successful retirement: the latest changes to Social Security, when to claim your spousal benefit, whether to buy long term care insurance or self insure, how to get more growth in your portfolio without adding more risk, and where to keep your emergency funds. Plus, we’ve got a Special Offer that is only available on YourMoneyYourWealth.com through THIS FRIDAY, so listen on or check the podcast show notes now to claim yours while you still can! I’m producer Andi Last, and here are the hosts of Your Money, Your Wealth®, Joe Anderson, CFP® and Big Al Clopine, CPA, to walk through 7 changes to your Social Security for 2019. No, six changes. Well actually, it’s more like 5 changes and a useful tidbit. Anyway. Al: Yeah, “apparently it applies to everyone else but me.” So anyway be aware that, so the benefits were higher – or are higher. And those are adjusted every year based upon a cost of living adjustment formula. And during the Great Recession and maybe a couple of years after that there was no increase. So it’s not guaranteed there’s gonna be an increase. But this last year was 2.8%. Joe: That’s the highest it’s been in quite some time. Al: It is the highest it’s been. Yeah, correct. Second one is the earnings limit climbed a little bit. So when you are age 62, or I should say before full retirement age, until that last year, if you take your benefits and you have earned income of more than $17,640 then you have to start giving some of those benefits back to the Social Security Administration. So that amount goes up a little bit each year. So easy way to think of it, just think of about $17,000 – you can earn about $17,000 if you’re getting your benefits and not be penalized, or not have to give any more back, I guess I should say. Joe: Yeah. I don’t even know how to phrase that because I think you and I both say that, but it’s not necessarily true. Joe: But they increase their benefit, so they get it back. Al: Yeah. In other words, because you took it and then have to give some back, they will recalculate what you’ll get in the future and you’ll be made whole, presuming you live a typical life expectancy. Joe: Well let’s say if you take it at 62 because this earnings requirement is only from 62 to full retirement age. So if you claim your benefit prior to your full retirement age, then there’s an earnings limit cap of what you can earn as earned income only. So that’s wages, self-employment. So that does not include pensions, 401(k) distributions, interest, dividends, and anything like that. Al: Yeah that’s important to repeat. So wages and self-employment income only. So you could have $100,000 of interest income, dividend income, capital gains, whatever, and that doesn’t count. If you’re not working, if you don’t have earned income, you can still receive full Social Security benefits. Joe: So I guess the point of this is that, if you’re working full-time, probably doesn’t make sense to claim your benefit because you’ll get that benefit and then the next year you’ll be assuming that you’re still going to receive your Social Security benefit. And guess what – the checks are gonna stop coming. Al: Right. Yeah, that’s true. That’s where you really feel it. Joe: Yes. It’s not like you’re going to cut a check back to the Social Security Administration. What happens is that you’re going to assume that, “hey, I’ve got a double dipping here a little bit. I got my full-time job and then I’m going to claim Social Security.” That first year you’re going to receive that benefit. And then when you’re going to file – no, it’s probably the first year and a few months until you file your tax return. Al: Agreed. Because that’s when – so the IRS knows what your earned income is, and they communicate with the Social Security Administration, and then all of a sudden they’ll stop your payments. Al: Yeah. So to make matters even a little more complicated, that final year you get your full retirement age, then the limit is now $46,920. So it’s a higher amount you can make and still keep your full benefits. Joe: So that means, let’s say if your birthday’s in July or June, halfway through the year, you can make about $50,000. So if you’re working January through April and you think that in your $100,000 gross income a year? Well, go for it. Claim your benefit, because you can make up to that $46,000 limit, then every$3 that you earn they’ll take a dollar back. Al: And then also I think people don’t realize once you hit full retirement age, you can make whatever you want. There’s no reduction of benefits. Joe: That is correct sir. Al: The tax cap grew a little bit. This year it’s $132,900. So workers pay 6.2% of their wages to Social Security Administration up to $132,900. That’s the limit for 2019. Last year was$128,400. So that means if you’re fortunate enough to make a couple hundred thousand dollars a year in salary, it’s only the first $132,000 that you have Social Security withheld. That’s that’s 6.2%. The Medicare part, the 1.45%, that continues – there is no limit on that. Joe: So there has been talk for the last several years of someone that makes over $200,000 single, $250,000 married, that then that tax would come back to some degree but who knows. Al: Yeah, we’ll have to see. Another one is the work credit earnings rise. Let me explain. So you essentially have to work 10 years to receive Social Security benefits, at least on your own record. And so they break it down to quarters and they call it 40 quarters, or 40 credits. And so each year is, if you work a year, that’s four credits – you gotta have 40 credits to be able to qualify for Social Security. Joe: Yeah but it’s based on income and that income is very minimal. It’s like $15,000 or something per quarter? Al: Yeah. It’s actually it’s $1,360 per quarter. Very close. But interestingly enough you don’t have to earn that every single quarter. As long as you earn $5,440 for the year then it counts for four quarters – which is four times $1,360. Joe: And they’ll look at, basically, your top earnings years. They go back 35 years to figure out really what your primary insurance amount is. Al: Yeah exactly. Another one is supplemental Social Security income is up. So these are additional benefits that you could get if you’re blind or you’re older and you don’t make a lot of money. So anyway, that benefit went up $21 a month. So there you go. (laughs) You know what? There’s only six. I thought there was seven. There are only six things. Al: I’m just all messed up! Anyway, so the last one is, did you know, you could view your benefit, your monthly benefit online? You go to the Social Security Administration, SSA.gov, and you set up an account and then you can access your records. If you’re not yet receiving Social Security you can access that statement that comes out that tells you what your benefits are going to be. It’s pretty helpful. So far the Social Security Administration says that about 35 million beneficiaries have gone online and registered. Al: No, but news you can use – a lot of people don’t know that. Al: (laughs) But it’s important to know, and it may be new information to people. Joe: Got it. But the title of the article says… Social Security changes. Al: I know. Yeah. Just go with it. (laughs) I don’t know, that’s gonna bug you the rest of the show now. Joe: (laughs) I’m good. Yeah. SSA.gov – go to SSA.gov/myaccount and get your account established. I don’t care how old you are. This is important stuff, and the younger you are, the more errors that potentially could happen throughout. So you want to make sure that you track your earnings records and things like that. So it’s always good to get an understanding of what the benefit is going to look like at your full retirement age, plus 62 and 70, and then thereafter. Or before that just tracking it to make sure they’ve got the correct information on you. Andi: I’ve actually looked at mine and there was a couple of years where they did not record an income for me and I had to correct that. Al: There you go. Well, that’s why you do it. It’s a good resource. I’ve signed up, as my wife Anne has. I will say the password system is very unforgiving. You get three chances, and if you miss it, then you’re locked out for 24 hours. That’s happened to me twice because you know how this works. Everyone has like 50 passwords and you don’t remember which one you did where. Anyway. So just be aware of them. Joe: Yeah, what is a good remedy for that? What do you use? Remember we had some guy who talked to us about password locking? Al: Here’s what I do. Joe: Just write it down? Al: (laughs) Yeah, I put it in my wallet. Andi: Put it on a post-it note on his computer. Al: No, I put them in my notes in my phone but then I password protect the notes, so I have to remember that password. Although I can also use my fingerprint. So as long as my fingerprint is valid I can get into my stuff. Thanks to listener Joe who heard this segment on our radio show in San Diego last weekend and Tweeted to us @ymywshow that you can use KeePass or LastPass for password management, find links in the podcast show notes at YourMoneyYourWealth.com – and hey, download our free Social Security Handbook from the podcast show notes as well to learn the history of Social Security, how it works, when to collect, the rules around spousal, survivor and divorced benefits, and taxation on Social Security. If you’ve got questions, go to YourMoneyYourWealth.com, scroll down and click “Ask Joe and Al On Air” and send it as a voice recording or an email. The fellas will answer your question right here on the podcast and we may even send you a video response! 11:25 – Should I Claim My Spousal Social Security Benefit? Joe: We got Patty from Los Angeles. “Thank you for the podcast.” With Mary Beth Franklin. If you guys missed that podcast, it’s one of a very popular podcast that was just a couple of weeks ago. You can download that right on YourMoneyYourWealth.com. “My husband and I enjoyed listening to it.” Thank you. “He is 70 and is now collecting his benefit. I am 66 and started collecting my benefit because I have the required amount of hours and was told my retirement age was 66. I declined my spousal benefit due to the fact that I am currently working in my solo owned banking business.” Oh, baking. Al: Solo-owned banking? (laughs) Bring me your money! Joe: Oh, I thought she opened up a little brick and mortar bank, I don’t know. it’s baking! All right, maybe some cookies, some doughnuts. Joe: Do you bake a doughnut or do you deep fry a doughnut? Al: They get deep fried. Joe: OK. So it’s a baking business, “and I was told if I kept working, my benefit would increase because I’ll be paying Social Security and at age 70 my benefit would be higher. After listening to the podcast, I’m wondering if I should just take half my husband’s benefit now instead of waiting. They told me during my interview that I would be able to change and take my spousal benefit at any time if I decided to. I have received three of my Social Security benefit payments. What I understood from your podcast is, if I declined my benefit now and waited until I was 70, I would receive an 8% increase each year, making my benefit higher by 32% over the next four years. I also understand that Social Security will only be giving me half my husband’s, which is currently $2,400. Mine is $900. Wouldn’t I have more money at the end if I took his benefit now? If I give back the money, restrict my benefit, and continue paying Social Security for the next four years, isn’t that like I’m helping them save money?” Huh. “I’m only adding to the kitty on my side for four more years, therefore making what they will add from his less, since they are only going to add the difference from his benefit to mine? Oh, and one more thing. Last year we had to cash in some stocks, which put us in a higher income tax bracket. So my last check from Social Security was about $200 less. So my benefit is now $720 a month instead of $900. Yikes. Help. Thanks so much.” OK Patty we got to unwrap this present, here. Which is a present. OK, a couple of things. I’m gonna try my best to answer this in full. But there are 14 different things here. (laughs) Let me go back. She was thinking, all right, if she’s taking her own benefit at 66. She declined to take the spousal benefit. First of all, if let’s say if you claim your benefit at 66 and you continue to work all the way through let’s say age 80, it doesn’t matter. They’re never going to reduce your overall benefit. They’re only going to increase it. So they calculate it each month. So how it works is this: let’s say I’m 66, I claim my benefit – they’re not going to reduce my benefit because I’m at my full retirement age. That’s a whole – there’s an earnings out and we’re not going to go there because she’s already at full retirement age. Claim her benefit at 66. So she’s still earning an income. Let’s say that income is higher or lower than any of the other 35 years of service that they used to calculate the Social Security benefit. If it’s lower, they wouldn’t reduce the benefit. If it’s higher, they would take that year and replace it with a lower year, hence increasing her overall Social Security benefit, just based on her earnings record. What she’s thinking – there was a question in there thinking the opposite. Al: Here, while you read it, let me translate what you said, (laughs) which is this: that the Social Security Administration takes your highest 35 years. So when you keep working into 70, 75, 80, Joe, to use your example, if you’re making more, it just replaces an earlier year, if you’re making less, it doesn’t impact you at all. So the fact that you could be adding to your Social Security between age 66 and 70 is a true statement, but you’re missing the bigger point, which is if you took spousal benefit right now, you could let your benefit continue to grow. Joe: It would continue to grow. So let’s say if she pays back the three payments that she received and she claims a restricted application, which she can still do, and so she is now claiming the spousal benefit, half of first spouse’s benefit. So her spouse’s benefit is $2,400. She would receive half of that. Al: Yeah. Well, let me explain that. I did the math. So if he started taking it at age 70, which I think he did, and it’s $2,400 now, I divided that by 1.32. Because that would have been his benefit at full retirement age. Joe: So she gets half of that benefit, not the benefit that he’s currently taking. Al: That’s right. So let’s let’s make that clear. So that’s about $1,800. OK. In other words, that would have been his benefit in current dollars at his full retirement age. So you divide that by two. Or in other words, 50% of that’s $900, which is the same benefit that she’s already receiving. Joe: So $900 is her own benefit on her record. If she said, “you know what, let me pay that $900 back to you, because I don’t want to claim mine. I would like to claim the spousal.” She’s going to receive the same $900. The math just happened to work that way. Al: It did, exactly. So you might as well pay those three months back, get the spousal, and then continue to take that all the way through age 70, and then you can switch to your benefit, which by that time will be 32% higher. Al: Will increase it, exactly. Al: Yeah. Well maybe not that much, but a lot. Al: (true) True. Anyway that’s a pretty clear thing. And I’m glad that you did listen to our podcast, because you can take the spousal benefit as long as your spouse is already receiving benefits. So that’s the new rule that changed. Joe: And then she’s like, “oh, one more thing. Last year I had to cash in some stocks which put us in a higher tax bracket. So my last check from Social Security was about $200 less.” Trying to think of…. Al: Well here’s what I think, Joe, I think because she was taking her benefit maybe before she turned 66, and so some of it was reduced, because she made too much money? I’m not really sure. Joe: I’m thinking what happened is this: so last year they sold a bunch of stock that increased their income. And I bet you her Medicare premium went up. Al: Ah, that could be. Joe: Because the Social Security benefit probably did not decrease. It’s because the Medicare premium is based on income. And so they looked at last year’s income, and they said, “hey, you make a lot more income,” maybe they increased the Medicare premium. Al: Yeah I agree with you, I think that’s correct. That’s probably what happened. Joe: So Patty look at your Social Security statement. Take a look at it, and then you can see what is taking out in regards to taxes. If you withhold taxes from it, what your Medicare premium is, and what your true Social Security benefit is, it’s going to give you a gross amount, then a net amount. So just compare that to last year, and then write me back and let me know if I was right or wrong, because they’re not going to reduce the benefit because of a tax bill. If you already claimed a certain amount of withholding from your Social Security benefit, they’re not going to change it because they don’t know you sold stock until you file your return. So it had to do something with the income that triggered something else. Andi: I got a question. You mentioned the fact that if she takes the spousal she can continue working and increase her own? So if you’re taking the spousal benefit the income limitation does not apply? Joe: No, because she is already at full retirement age. If she was under full retirement age and she was still making income and taking the spousal benefit, then yes. If she made more than $17,000 and some change then every $2 that she earned, they would take a buck back. But once you’re full retirement age then that does not apply. Andi: And the other thing that I learned is that she isn’t going to be getting half of his age 70 benefits, she’s only getting half of his full retirement age benefit. That’s amazing. Joe: Correct. And then another thing happens though too, it works on a double side. I’m glad you mentioned that, because it’s like, “well, push it out to 70 because I want half of that benefit.” But then also on the other side if they’re like, “OK, well don’t claim it at 62 because I need the spousal benefit and I don’t want a half of the lower amount.” It’s always gonna be based on the full retirement age. So let’s say one spouse takes it at 62, and their benefit at 62 is $1,400 versus $2,000, they’re still going to receive the 50% on the $2,000 benefit, as long as she takes it at full retirement age. Andi: Those are two critical pieces of information. The whole time I’ve been doing this show I didn’t know those things until today! Al: And it’s not widely known, and as soon as you ask a question, then Joe talks more about how this- it’s just more and more complicated. There are, books on this. You can read a book and go, “What did I just read?” And this is our Social Security retirement system. Joe: Yeah, and it’s a huge component of – I mean here, do the math on this, Alan, because let’s say $900, let’s say – I’m going gonna say it’s going to be – go $1,000. So that’s $1,320 would be her full benefit at age 70. So $1,320 minus 900 is what? $420? Al: Well let me do it properly. So $900, 32% increases is $1,188 minus $900, so she would make another $300 per month, roughly. Joe: But if she’s still working, plus the cost of living adjustment on it, call it $400 a month $400 times 12, times let’s say 20 years. Al: OK. So that’s $120,000. Joe: SEE, RIGHT THERE PATTY! $120,000! I’LL SPLIT IT IN HALF WITH YA! (laughs) BOOM! Hey, don’t skip ahead on this one! We have a new guide available through Friday, March 22nd ONLY for you to download for free. Social Security is just one major aspect of your retirement plan – there are so many factors that all have to work together for a successful retirement. Joe and Big Al are talking about Do-It-Yourself Retirement Planning this week on the Your Money, Your Wealth TV show. Watch online at YourMoneyYourWealth.com and click Special Offer to download the DIY Retirement Guide for free. Download it before it’s gone! Click Special Offer at YourMoneyYourWealth.com for the DIY Retirement Guide for a limited time. And next week, tune in for the Your Money, Your Wealth TV show season 5 finale! Now, more of your money questions. 23:15 – How Can I Get More Portfolio Growth Without Magnifying Risk? Joe: This is Todd from Washington state. Man, we get people from all over the place. Al: We do, it’s great. Joe: (laughs) Yeah I know. People are finally get my name right. Now people are calling me Dennis the Menace. Joe: “I’m a huge fan of the show and I thank you for your honesty and great humor.” Thank you Todd. “I feel there are many people in my situation who would benefit from this question. Here it is. I am 51 I have $100,000 in my company 401(k) and hope to retire in my 60s, or at least retire part-time. My future financial needs adjusted for inflation will be about $4,000 a month, so that’s $48,000 in future dollars.” So he’s done some arithmetic there. “I aim to spend much of my time living in Thailand so I can get by on much less than $4K a month…” Huh. Thailand. Never been. Al: I have not either, but my son has. He really liked it. Al: Yes. I mean, tropical. Joe: Beats, I guess, Washington state. Al: (laughs) No we don’t, because we’re reading it. Joe: I think it’s great, Todd. Really enjoying this so far. “My 401(k) is invested in target date 2035. Over time the fund will automatically continue to increase the percentage in bonds yearly by the glide path thus limiting and slowing the growth.” Thank you for that explanation on a target date fund, Todd. “I actually need to accelerate the growth since I haven’t saved enough. Some of the funds in my 401(k) will not be used until my 80s, 90s, etc. I’m questioning why the assets I won’t touch for 30 or 40 years should have bonds at all? So my question is, how can I get more equity growth in my portfolio without unduly men magnifying my risk?” So here are Todd’s ideas. Let’s see if Todd is on point here. Al: He’s got three of them. Joe: It’s not good, thank you, Al. (laughs) I was going to say something else but you saved me. The target date fund is – you’re only supposed to use one target date fund. What do you want to retire? Okay I want to retire here. That’s the fund you choose. So don’t ladder it. It’s a redundant strategy. You’re just going to pay more fees and it doesn’t make any sense. Al: Yeah right. Agreed and therein is one of the limitations of a target date fund, which is this: it puts you in an average basis with everybody else, and your situation may be different. And so in your case, you’re looking that you need a little bit more return to make this work, and you need more equity, so a target date fund may not be the right choice. You can sort of do your own target date fund by doing a domestic stock fund, an international stock fund, a bond fund – three investments and you just decide yourself how much you want in each, and just do it yourself. Joe: Right. “Here’s idea B. Start a Roth IRA, max it out and go all equities in this account at least for the next 15 years or so, so I can get access to the asset classes that are underserved in my 401(k): small cap value, REITs, etc. through Vanguard ETFs, mutual funds etc. And/or -” Here’s idea C, “stockpile a lot of cash. Build up my taxable brokerage account, and use these funds to part-time retire in my 60s while my 401(k) and Roth continue to grow.” Oh my God, Todd. Al: OK let’s go with B.
Joe: How did he know that.. Todd! Andi” He’s a big fan of the show! Joe: Jesus. All right. This is what you do, Todd. You max out the 401(k) plan, you max out a Roth IRA plan as much as you possibly can. You have a globally diversified portfolio. You listen to Al, you pick three funds, you have 17 years for growth, so you probably want, I would say 70% equities, 30% bonds. You want the bonds in the overall portfolio so when the equities go down you can buy more equities. That’s going to be your safety buffer there. It’s going to help for trading purposes as well. You have a long time horizon, you’re going to live to age 100. So I’d probably have that stock equity mix for quite some time. Then when you get to age 67 or whenever that you want to retire, you’re going to live in Thailand, living off a couple of thousand bucks a month. You’ve got $100,000 now? Al, $100,000, $30,000 a year savings over the next 17 years at 17% is what? Al: Okay, so $100,000, $30,000 a year, at 7%. Joe: $1.2 MILLION, TODD! BOOM! 4% of that ia $40,000. $44,0000. Al: Yeah. Which will generate maybe $3,500 of income. So there you go. Or actually, sorry, $4,000 to $5,000 of income. Joe: Yeah. And then that’s in today’s dollars. You go back, future? I mean we just did your financial planning here in 10 minutes. And you gave me a cold sweat. So yes, do that, right? And hopefully Thailand goes well and we appreciate your listening. 31:22 – Where is the Best Place to Keep Emergency Funds? Al: That’s a quick question. Joe: Let’s give a quick answer. What do you got? Joe: Do you have CDs? Al: I do for my emergency funds. Yeah, I have a 14 month CD at my credit union. And if I have to pull the money out early, I could lose 180 days or half a year of income. But I’m willing to take that risk because in a money market its virtually nothing anyway, in terms of the earnings, so that that’s what I d0. Joe: Got it. How do you shop for CDs? Al: Well I just type in like “CD rates” on Google and all kinds of stuff pops up, and then I compare that to, I have a credit union here locally in San Diego. And as long as they’re close enough, that’s easier and more convenient. Joe: Yeah. You’re not going to open up a new account for 10 basis points. Al: No. And the difference, like, my credit union was a little bit lower, but it was probably 20 basis points lower – not worthwhile. Joe: Got it. Alrighty. So if you do cash that out early what happens? You just lose a little bit of interest? Al: I lose up to six months of interest. So everyone’s different. Like they have different ways of calculating the early withdrawal penalty. An early withdrawal penalty is nothing more than losing some interest. So that’s how to think about that. Joe: What rates are going on with CDs right now? Al: I think I get 2.3, 2.25%, something like that. Andi: For what term, what duration? Al: 14 months. And that was recent. That was in February 2019. Joe: All right. There you go. Rates are going up. 33:55 – Should I Buy Long-Term Care Insurance or Self-Insure? Joe: Tom from Colorado is on. Tom: Hi my name’s Tom. My wife and I are both in our early 60s. I’ve been reviewing long-term health care policies and they don’t really seem to offer a lot of coverage. And I wondered what the analysis is, what kind of financial analysis, in terms of whether I should purchase long-term care insurance or just self-insure that and invest the money to have it there for if and when it’s needed. We have enough assets to self-insure but I’m not sure that’s the wisest thing to do and I’m trying to evaluate this risk. Thank you so much. I appreciate you taking my call. Andi: Think, Act. and Invest Like Warren Buffett by Larry Swedroe. All right, making a note. Joe: Yes. Tom gets a book. All you gotta do folks is just leave us a message and you get free gifts. All right Alan, what do you think? Because Tom is sitting in the same boat that you’re in. Al: Yeah that’s that’s true. I’m in my early 60s and that’s a decision that you’ve got to look at. So here are a few things I might say, and that is the long-term care insurance, relative let’s say 10 years ago, is a lot more expensive. Joe: And the benefits have reduced significantly. Al: (laughs) that’s probably true. Joe: So let’s say that you buy a policy for $10,000 a year, hypothetically, for $300,000 in benefit. I have no idea. I don’t know what he’s looking at. I don’t know what his elimination period is, I don’t know if he’s getting it with his spouse, to get a spousal discount – there are all sorts of iterations on how you can buy a standalone long-term care insurance policy. And let’s just explain what that is first. A long-term care policy works as – if you have one of your activities of daily living, I guess two out of the four. I think there are four, I’m not an insurance agent but I think there are four. Al: I think there are four too. Joe: If two of those go bad, you can’t bathe yourself or clothe yourself, can’t get out of bed, can’t transfer, can’t move… right? And continence? Andi: Eating, bathing, dressing, toileting, transferring, and maintaining continence. Joe: OK well I guess there’s a little bit more than four. Joe: Six. So if two of those go bad, then the long-term care insurance would trigger. If you have it. So now you need help – you need someone to help do one of those activities of daily living. And so you can go into a home and have full time care, and that full-time care – in Colorado, I don’t know, I’m guessing it’s going to cost you 60 to $80,000 a year depending on where you go. You could probably go to a really nice place and it’s going to cost you a couple hundred thousand dollars a year, or you could go somewhere that’s not so nice and it probably cost you $50-60,000 a year. So on average, the average person’s long-term care stay is roughly four years. So if it’s going to cost you $50,000 a year for four years, you know you can do the math somewhat easy. That’s going to be $200,000. So you could say this: all right well $200,000 is what that need is in today’s dollars. So that is also going to increase with the cost of inflation of probably close to, what, 7-8%. So that $200,000 is going to be roughly $400,000. You following my math here folks? Al: I got it. I’m with you. Joe: All right. Thank you. So what Tom needs to do is say, well what’s the need? In future dollars it’s going to cost me X. $400,000 of money that needs to come from somewhere to pay for the care. So he can insure it by buying a long-term care policy and saying, I want to cover that need by either 100%, 50%, 30% whatever he wants to do. So maybe it’s a little bit of self-insure like Al suggested, maybe you fully insure, or maybe you do somewhere in the middle. So you do somewhere in the middle and you say, “I want to cover half of the cost.” So you need $200,000 of benefit, hypothetically. Then you look at what’s the premium going to cost me to get this $200,000 of benefit? And if that cost is $5,000 a year, $10,000 a year, whatever it is, you take that premium dollar that is going to go to the long-term care policy and then you say, let’s say I invest that premium versus buying the policy. What rate of return do you need to generate on that premium dollar to get you to the same pool of money that you would have as the long-term care policy would pay out? Does that all jive? Al: Right. (laughs) Let me make it simpler. Al: I know but I’m going to go back to my answer, which is when you do all this math, what you’re going to find is that by the time you add up all your premiums and put in a rate of return, that sum total is going to be less than your benefit. So in other words, if you need it, you’re going to be glad that you have it. If you don’t need it, it’s wasted money. That’s what you’re going to find after you do all this. And you’re absolutely right. That is the way to do the calculation. Joe: Yeah. Because I think that’s what he was asking. He’s like, “financially speaking, how do I calculate this, how do I calculate the risk?” Well, the likelihood of you going into a long-term care facility, Tom, is probably pretty high. I mean, it’s higher than other types of risks. And high means, I don’t know, maybe 50%? Al: Yeah some like that. It doesn’t mean it’s going to be four years, it might be a few days. Joe: It could, yeah. You break a hip, right? Or you could be like Christopher Reeve and be in there for 20 years. Who knows. Or maybe you die of a massive heart attack or you die peacefully in your sleep. Al: Yeah. And you don’t need it. Andi: Actually it’s even more than that – longtermcare.acl.gov says someone turning age 65 today has almost a 70% chance of needing some type of long-term care services. Joe: Oh boy. Washing Big Al’s sheets, I mean that would – I would want to get paid a hundred grand a washing on that. Andi: See, and this is why you don’t want to inflict that upon your spouse. Joe: Oh my goodness gracious. All right. That’s it for us. We’ll see you again next week. The show is called Your Money, Your Wealth®. Once again, if you’ve got money questions, go to YourMoneyYourWealth.com, scroll down and click “Ask Joe and Al On Air” and send us a voice recording or an email. We’ll respond here on the show, and we might even send you a video of our answer! And we’ll send you Larry Swedroe’s book, Think, Act and Invest Like Warren Buffett just for asking Joe and Big Al on the air.